Rabbi Friedman recently joined the Kollel team in Dunwoody adding to the confusion as to which which Rabbi Friedman are you talking about!? 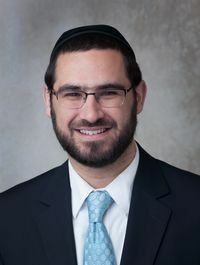 Born in Jerusalem and raised in Baltimore, Rabbi Friedman is moving here after three years in Massachusetts and is glad to be in a warmer location. With his exuberant energy, Rabbi Friedman can be found all over town teaching and running programs. His warm smile and love of people make him a pleasure to be around. He loves to sing and be in the great outdoors. Roasting marshmallows & campfire singing are some of his favorite activities. Rabbi Friedman studied in Yeshivas Toras Moshe in Israel & Ner Yisroel in Baltimore receiving a Bachelors & Masters of Talmudic law.